The NeRD eReader is secure, but it's got plenty of reading material baked in. There are plenty of eReaders out there, but none of them are secure enough to be used on US Navy vessels. That's not a marketing tagline, either, as the Navy doesn't allow consumer devices with cellular radios or WiFi connections on submarines (so no iPad or Kindles allowed). No Kindles means reading is a bit of a pain, not because seamen have to read physical books, but due to the limited supply of reading material on your average submarine. 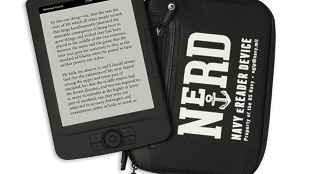 So the Navy has partnered with Findaway World to create the NeRD, or Navy eReader Device. The NeRD has no connectivity ports or wireless connections, so there's no chance of the device being used to betray a submarine's location. Each NeRD comes pre-loaded with 300 titles, ranging from Navy-specific material, to science fiction, to classics and modern titles. These titles will never change, until the existing NeRD is replaced with a new model. Each Navy sub will be receiving five NeRD devices for use by the crew, with more to follow as production ramps up.